Nasim Asgari is looking at the tofu sitting in her shopping cart, waiting for her mother to join her at the food aisle at the No Frills store in north Toronto. I wonder what it’s going to taste like, she thinks. She adjusts her headscarf. Tomorrow she’ll start her trial 40 days as a vegetarian. It was time for a diet change. Time for a proper cleanse. The moment feels like a dramatic slow motion film scene for the then 16-year-old. The man never looked directly at her but his words took her mind off tofu. Slowly they hit her eardrums and connected to her mind: Oh, that’s for me. In that moment, Asgari said nothing. Upset, she went home that night, almost a year and a half ago now, and translated her emotions into lines of poetry in her journal. She performed those lines for the fifth or sixth time on March 8, 2015 at “When Women Rule the Night,” an International Women’s Day event held at Beit Zatoun, a cultural centre, gallery and community meeting space located in the west side of Toronto. She named the poem “Breath of a Warrior”—a literal translation of her Iranian name. Nasim means breeze. Asgari means warrior. And people who look and dress like me should have no business here. Of the people who ‘should’ belong here. 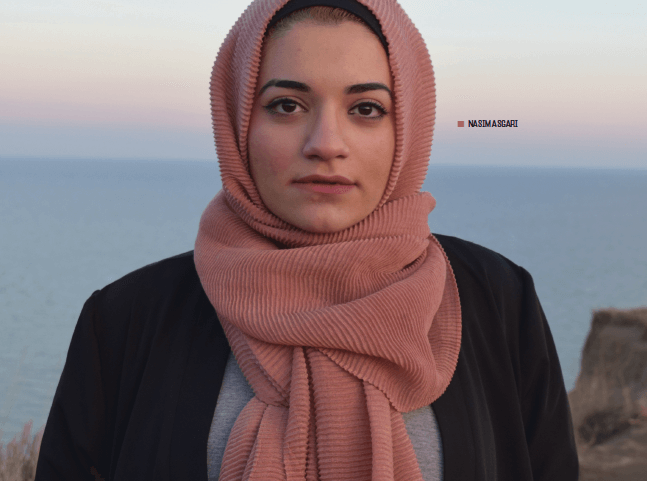 “The Quran says to greet ignorance with peace,” says Asgari, so she turned to spoken word poetry to calmly create a counter-narrative against hate speech. She has chosen to embrace her “animal” self. She has released her suppressed inner voice and speaks out loud now of her Muslim experience in Toronto. She and other like-minded young Muslim women have formed a pack of poetesses that empower each other, not only through their own encounters with bigotry and cultural clashes, but those of other Muslims around the world, from the unwarranted deaths of Deah Barakat, Yusor Mohammed Abu-Salha, and Razan Mohammad Abu-Salha at Chapel Hill, North Carolina in January 2015 to the foul and false images of Muslim women that ISIS propagates in Syria. Closer to home, the group was part of the movement strongly advocating the welcome of Syrian refugees to Canada. They do it with pens and voices, not teeth and claws. In London, Ontario, 23-year-old Rozan Mosa performs her rhyming spoken word poetry, clad in a niqab. “Simply standing on stage is powerful enough to get people thinking about their prejudice,” says Mosa. Muslim women like Asgari and Mosa are part of an evolving tradition of slam poetry and spoken word in North America that is reactionary in nature and activist in function. It grew more prevalent among Muslim American youth initially in response to the events of 9/11. In his report on “The rise of Islamic rap,” Peter Mandaville, director of the Ali Vural Ak Center for Global Islamic Studies at George Mason University, writes that Islamic hip-hop met a need for youth who were “searching for music that reflects their own experiences with alienation, racism and silenced political consciousness.” For Muslim American women, it was a new channel, making a space for their voices in a male-dominated field. In 2002, Palestinian-American poet Suheir Hammad’s performed her poem “First Writing Since” on Def Jam Poetry, an HBO spoken word TV series hosted by Mos Def, marking the shift. In Canada, MuslimFest, an annual three-day festival in Mississauga, Ont., and one of the largest Muslim arts and culture festivals in North America, also emerged as a response to 9/11. Founded in 2004, it was meant to answer the question: How can we move forward as a community and show youth that Islam is more than the stereotypes portrayed in media and elsewhere? “Muslim Canadians come from such different backgrounds, cultures and experiences,” says Maduba Ahmad, a 23-year-old organizing member of the festival. “MuslimFest is a platform that allows them to just take their identity, whatever they associate it with, and vocalize it.” They’re speaking to themselves and also to the 25 percent of the attendees that are not Muslim. As these spaces flourish, community leaders I spoke to have noticed more women coming forward, especially as news coverage of Muslim-based issues, unwittingly, gives them material for their art. “We try to provide a unique, alternative space that doesn’t always exist,” says Yasmin Hussain, violence prevention coordinator at the Muslim Resource Centre (MRC) in London, Ont., where Mosa first performed. Like the MWC, the overarching goal isn’t to bring more women to the stage but create spaces that are more inclusive and safe for them to be comfortable and empowered to enter. “They are valuable and valid,” she says, these spaces that encourage and support the lesser-known insights and stories shared. To do so effectively, some platforms choose specific topics that introduce women to the spoken art form. Platforms like Outburst! Young Muslim Women’s Project, an awarding winning project by the Barbra Schlifer Commemorative Clinic in Toronto that began September, 2011, are spaces specifically for Muslim girls to speak out about violence in their community. They create sisterhoods, embracing and empowering young women like Asgari. it an “inner revolution,” and in many ways it has become one. Tonight, Beit Zatoun is a makeshift coliseum, and the tigresses have been released, ready to tear apart anti-Islam, antifeminist, anti-human bigotry and stereotyping. About 100 people, three-quarters female, mill about the wood-panelled town hall type of room with high ceilings and haunted-house style chandeliers. Today is a safe space for the female performers to share their personal truths with the audience. No judgement, no insult, no backlash. We’re all just listeners and observers to the stories and journeys these women let go of on the stage. The venue’s name is Arabic for “House of Olives,” a fitting name for the cathartic atmosphere the room embodies. In a Quranic parable, the olive tree is referred to as “a blessed tree … neither of the east nor of the west, but whose oil would almost glow forth, though no light touched it.” Every performer seems to be an olive from that tree tonight, not embodying a geographical location, but shining bright in the spotlight. Asgari is the last performer at the open-mic portion of the evening. She stands against a wall off to the side before she’s called to stage. Her eyes are closed but her lips are moving—she’s rehearsing. She wears a blue and yellow scarf on a black dress with a full-length chiffon coat. She’s introduced as “a 17-year-old high school student who will blow your mind” by this evening’s emcee. As always, before she begins, Asgari calms her nerves by saying a verse of the Quran to herself. She lifts her head, moves one step back from the microphone and raises her arms. For love is already having tea inside. Asgari’s hand gestures in this performance make it seem like she has the wings of an albatross. The big sleeves of her coat rise and fall with every arm movement. She seems to soar on her words. The audience snaps their fingers melodically, indicating some kind of collective cerebral connection to her words and her emotions. Some nod their heads, some express their love more audibly—“soul grunts,” they call them. When her voice softens, the audience goes silent. When she raises her voice louder, the audience responds proportionally. They’re responding to a transformation of a small girl into an impressively powerful woman. In mere minutes she gives the crowd goose bumps, makes them laugh, makes them cry, and lifts their spirits. When she’s done, she walks away to the thunderous applause of the crowd. Quick hug to the emcee, some smiles to her friend, and a couple of high-fives. She once described the process of performance as a release of energy, transferring the heavy thoughts in her head into space. That’s why, after most performances, she leaves for a moment, to escape the thoughts she left floating around in the room, to escape, what she calls, the uncomfortable vulnerability of her open mind and soul. Afterwards, women come up to thank her for her voice. Some hug her, some hold her hands. The cerebral connection is acknowledged physically. We are the same, suggests the hug. Thank you for understanding, suggests the two-handed hand shake. Some, like me, just nod and smile with tears in their eyes to indicate that for five minutes, our inner struggles were her spoken thoughts. The loudest voices supporting Asgari at these performances are her friends from Outburst!. Asgari joined the organization in 2014. There, she found a family of young women who accepted each other without judgement and listened to one another’s voices. They called their group a sisterhood and have grown to become just that: supportive, dependable, and present. One of her “big sisters” in the crowd is Zeinab Aidid, a21-year-old Somali-Canadian with beautiful long black-to-brown braided hair and big, brown eyes. She says she has been obsessed with def poetry jam since she was 13 years old, when she went to a spoken-word event at a Muslim festival in Mississauga. There she became entranced by Amir Sulaiman, who was then one of the only prominent Muslim spoken-word artists. He performed a piece that the CIA once questioned him on because it deemed the words “anti-American.” His wife, Liza Garza, also a singer and a poet, wasn’t allowed to perform because the organizers didn’t want female performers, something that annoyed Aidid at the time. But, Sulaiman brought his wife on stage anyway. Between the life-threatening power of Sulaiman’s poetry and Garza’s performance with her baby strapped to her body, Aidid couldn’t imagine doing anything else. Aidid tossed a couple of braids on her face towards the side as she casually told me how she used to wear the hijab all through high school. She doesn’t anymore. We were sitting in a reading room in the University of Toronto, at the end of one of the building’s signature long, wooden Hogwarts-esque tables. She pulled out her driving licence: a picture of a younger Aidid wearing a headscarf. “I wasn’t pressured or anything. I just felt that it was a lie,” she says. “I was giving off this vibe that I was a devout Muslim, but I wasn’t.” She’s working on a new piece about her experience with the hijab, trying to convey her guilt over not experiencing what other Muslim girls do. 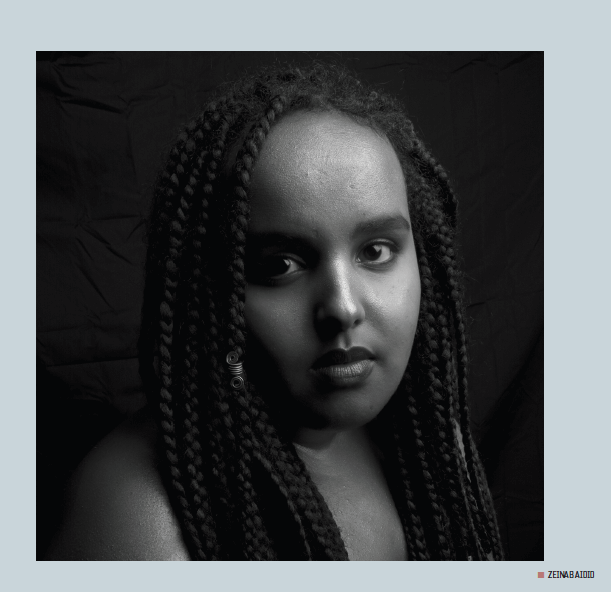 Even though she was born and raised here, Aidid doesn’t consider Canada to be her home: “I don’t feel any attachment to this land, but then what land do I have an attachment to?” Poetry, for her, is a way to document alternate narratives to find that sense of belonging. “I never read a story in a textbook I could relate to.” Asgari has told me the same thing. An animal can’t call a cage home. In Grade 7, my English teacher was a tall, bald, tubby British fellow who never wrote on the chalkboard behind him but used his versatile voice box to prove the power of poetry. “You have to read it to know it,” he used to say, “but you have to read it right.” He would demonstrate. First, he read Shakespeare’s “Shall I compare thee to a summer day” in his loud, booming headmaster tone, onerously emphasizing every other word with his right arm powerfully flailing up and down. Then he read it in his soft, melodic tone, the volume of his voice decreasing as he concluded the poem, the last line just a few decibels above a whisper. I’m reminded of this today as I hear Aidid voice her piece about her cousin who was shot over a stolen phone that happened to belong to a drug dealer in a gang. When Aidid told me the story at U of T, she looked away and spoke vaguely, mentioning that lately her writing had been “consumed” by her cousin. She tells the audience this too when the emcee affectionately calls her to the stage in a booming sports announcer voice as “Z-Money”—a joke from Aidid’s high school days when she wanted to be a rapper. Today, Aidid looks right at the audience and tells her cousin’s story softly, powerfully, emotionally, fiercely. She repeats the last line three times. The first time is soft. She chokes up and holds back tears the second time. She pauses. The crowd listens silently. No snaps, no soul grunts, no verbal applause. Only Aidid’s voice pierces the room the third time. When she finishes, she walks away quickly to roaring applause. Her sisterhood meets her at the back with supportive hugs. The next speaker thanks her for sharing. He’s been reminded of a similar experience he had, a shooting at a pizza joint. He was happy they could collectively mourn, remember, and move on. A couple of weeks later, I was walking down the street one sunny afternoon, heading to an Outburst! event, when Asgari tells me, “sometimes existing just feels heavy.” Aidid turns to her, “You should write that down.” Asgari replies, “I think I might have somewhere.” They stop at a red light, watching the red hand, waiting for it to turn green. Young women like Aidid and Asgari trace their ability to tell such poetic stories to their ancestry. In most cultures, the origins of spoken word can be found in the oral tradition in religious, cultural, and familial setting. It is the oldest form of poetry that has evolved over time, but its core principles still remain—consciousness of how words sound out loud, the cerebral thread that connects speaker to audience, and the power of the tone of voice. There is a reason this oral culture is handed down. MWC’s Ballah says Islam is poetic in nature, and poetry has historically been an integral part of Muslim culture. A fable recalls how Prophet Muhammad entered a verse of the Quran into a poetry competition without attribution. The entries were put up for display and a poet from afar read the verse and declared it to be the most inimitable piece of poetry he had ever come across. Islamic folklore is also littered with examples of women being unable to tell their stories. Many were slave girls fighting for their voices to be heard. Some were queens and princesses, fighting for a female narrative. Ballah has her own stories to tell. Her book of poems Preparing My Daughter for Rain was published in 2014, the same year she started wearing the hijab. On Jan. 7, 2015, the day of the Charlie Hebdo shooting, she was spat on by a woman at a subway station. Her assailant missed. A couple of years earlier, while she was at university, a drunk young Muslim man, so ashamed and saddened by his actions, began reciting Quranic verses in an attempt to prove to Ballah, to God, to himself that he was a Muslim. I swear I am Muslim—he slurs. He keeps on saying ‘No you don’t understand. In this way, identity and culture continue to be lock and key to the trappings of personal struggles and societal perceptions. Ballah is finishing her new self-published book titled Skin and Sun, documenting her struggle to understand her position in the world as a Black Muslim woman, set for release this year. This summer, she’s set to speak at Duke University as part of a panel that discussed Muslim women who use art as a medium to express themselves. Asgari is also set to release her first collection of poetry, at the age of 18. Eighty-nine backers raised more than $5,000 on Kickstarter for the book to be published. Called What was Swept Under the Persian Rug, the image on the cover of the book is a powerful gothic photo of Asgari standing on a Persian rug in a desert landscape, her head raised to a grey sunset sky, her arms wide open, her coat made of faded Arabic lettering. It’s the still image encapsulating the moment before lightning strikes and thunder roars, all at the beat of a woman’s command. FATIMA SYED has logged way too many hours on airplanes. After a decade in Saudi Arabia and half a decade in Dubai, she is now a freelance writer in Toronto.